The FN Scalable Uninterruptible Power Supply (UPS) provides flexibility and reliability at an economical cost. Rather than purchasing an expensive cabinet to house modules, a user can configure a UPS system using individual 3, 4, 5, 6, 8 or 10kVA models, providing up to 30kVA with N+1 redundancy. 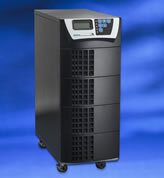 The FN UPS features galvanic isolation and ECO mode with 97% efficiency. The rackmount FN Scalable UPS offers flexibility and reliability, including galvanic isolation, at an economical cost. They are compact—the 6kVA is only 7U. Instead of using an expensive cabinet to house modules, a UPS system is configured with individual 3, 4, 5, 6, 8 or 10kVA models, providing up to 30kVA with N+1 redundancy. The ECO mode provides 97% efficiency.